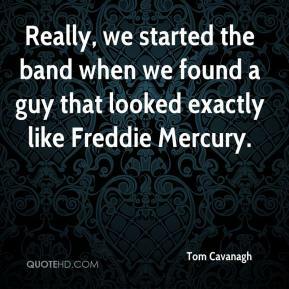 Really, we started the band when we found a guy that looked exactly like Freddie Mercury. We really take our music seriously and we take the band very seriously. But we have a lot of personality. 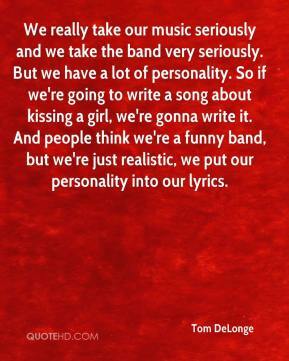 So if we're going to write a song about kissing a girl, we're gonna write it. And people think we're a funny band, but we're just realistic, we put our personality into our lyrics. 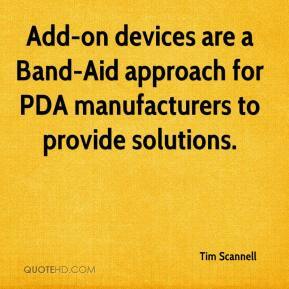 Add-on devices are a Band-Aid approach for PDA manufacturers to provide solutions. 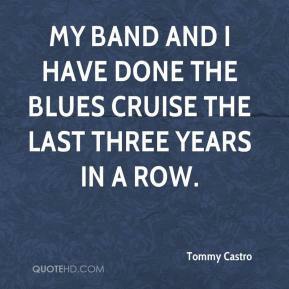 My band and I have done the Blues Cruise the last three years in a row. We're a pretty boring band. We get good sleep. Eat well. 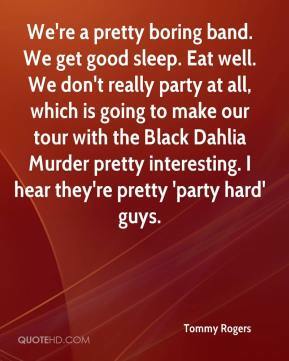 We don't really party at all, which is going to make our tour with the Black Dahlia Murder pretty interesting. I hear they're pretty 'party hard' guys. 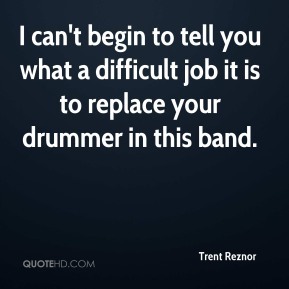 Truthfully, every band has their different challenges. I think we have ours, and that would be one of them. 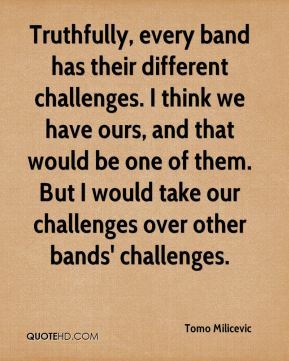 But I would take our challenges over other bands' challenges. It's never a second thought. 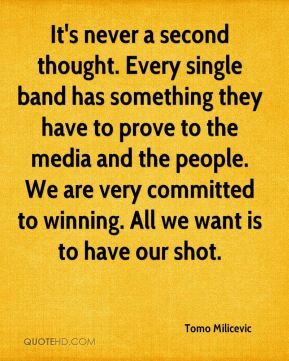 Every single band has something they have to prove to the media and the people. We are very committed to winning. All we want is to have our shot. 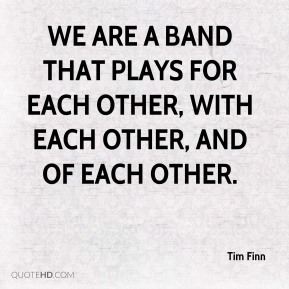 We are a band that plays for each other, with each other, and of each other. 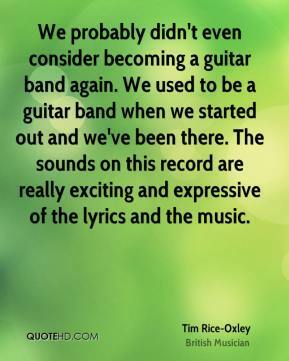 And I'm really excited about this band. 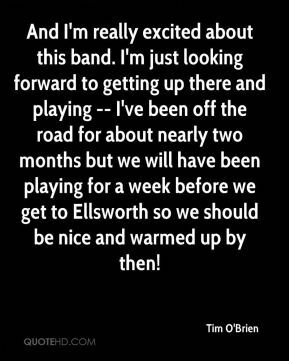 I'm just looking forward to getting up there and playing -- I've been off the road for about nearly two months but we will have been playing for a week before we get to Ellsworth so we should be nice and warmed up by then! The name changes reflect the growth in size and stature of the band program. 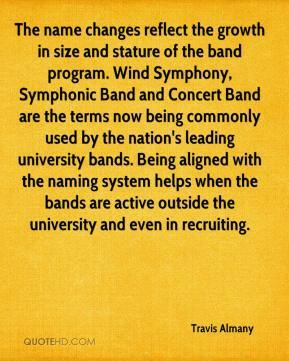 Wind Symphony, Symphonic Band and Concert Band are the terms now being commonly used by the nation's leading university bands. Being aligned with the naming system helps when the bands are active outside the university and even in recruiting. 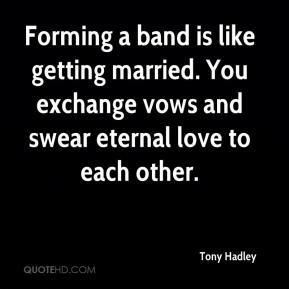 Forming a band is like getting married. You exchange vows and swear eternal love to each other. 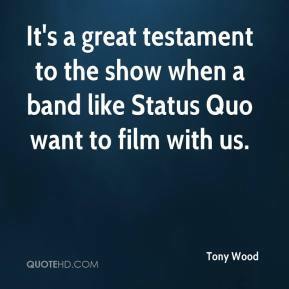 It's a great testament to the show when a band like Status Quo want to film with us. 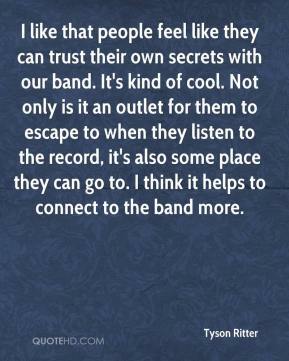 I like that people feel like they can trust their own secrets with our band. It's kind of cool. 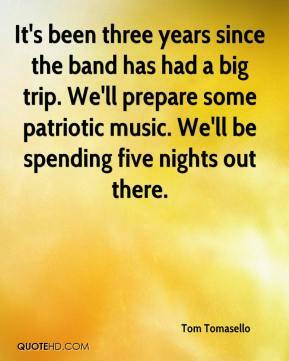 Not only is it an outlet for them to escape to when they listen to the record, it's also some place they can go to. I think it helps to connect to the band more. I can't begin to tell you what a difficult job it is to replace your drummer in this band. 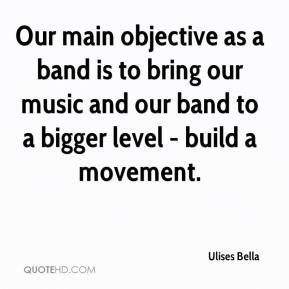 Our main objective as a band is to bring our music and our band to a bigger level - build a movement. 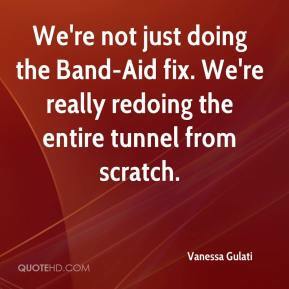 We're not just doing the Band-Aid fix. We're really redoing the entire tunnel from scratch. 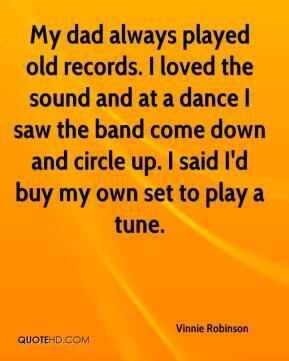 My dad always played old records. 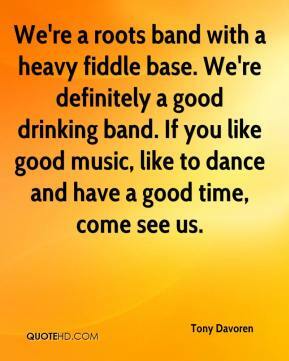 I loved the sound and at a dance I saw the band come down and circle up. I said I'd buy my own set to play a tune. 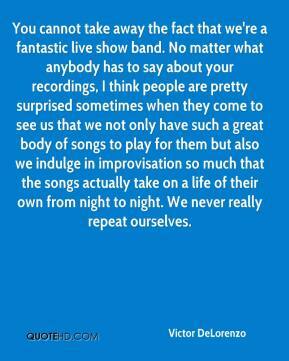 You cannot take away the fact that we're a fantastic live show band. No matter what anybody has to say about your recordings, I think people are pretty surprised sometimes when they come to see us that we not only have such a great body of songs to play for them but also we indulge in improvisation so much that the songs actually take on a life of their own from night to night. We never really repeat ourselves. 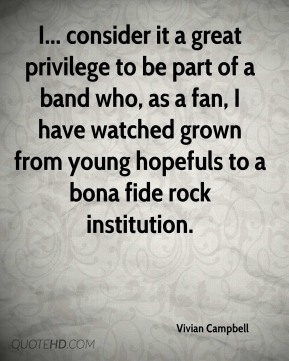 I... consider it a great privilege to be part of a band who, as a fan, I have watched grown from young hopefuls to a bona fide rock institution. There is the understanding of the music and culture of the area. 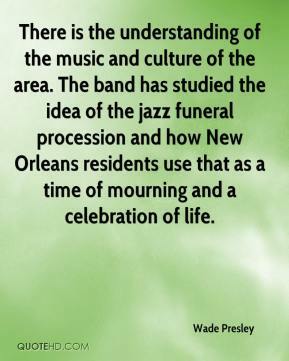 The band has studied the idea of the jazz funeral procession and how New Orleans residents use that as a time of mourning and a celebration of life. 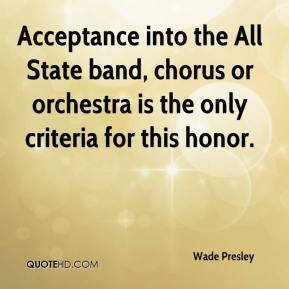 Acceptance into the All State band, chorus or orchestra is the only criteria for this honor. 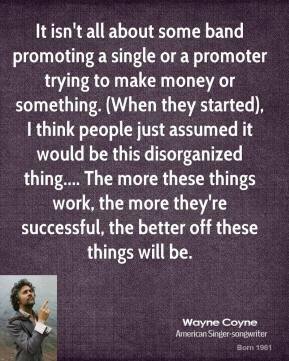 It isn't all about some band promoting a single or a promoter trying to make money or something. (When they started), I think people just assumed it would be this disorganized thing.... The more these things work, the more they're successful, the better off these things will be.